It’s now eight games without a win for FC Halifax Town after they drew a dour game 0-0 at home with Woking. Halifax were winless in seven, and Woking without a win in six, and it showed. In the context of Town’s run of results, a draw against Woking is a good result, and a hard-working performance, albeit lacking in quality, but not effort, is encouraging after recent outings. Town went into the game having suffered back-to-back defeats for the first time since August last year, so three-in-a-row would have been disastrous. Woking had only failed to score in four of their 21 games this season before the match, so a clean sheet was commendable too. Town were much better defensively after conceding 10 goals in their last four games, a ratio that needed to be reduced. Only two goals in five home games is a concern though, with Town never really looking likely to score. There were debuts for Hull right-back Josh Clackstone and midfielder Harry Middleton, on loan from Port Vale, thanks to Mr Aspin. Middleton and Batty quietly caught the eye with some good touches on the ball that hinted at their Football League schooling. They combined well just after half-an-hour when the former’s low corner was fired over by the latter. Clackstone was also solid at right-back, diligent and disciplined in his work, and possessing a good long-throw. The game itself though was bordering on awful, with neither team playing at quick enough tempo or with fluent enough passing to create anything. With both teams deploying a big front-man, neither had the option to play in-behind the other’s defence, so the game wasn’t stretched and there wasn’t much space for either midfield to operate in. Town’s first choice in possession was usually to go up to Tom Denton, which meant Batty and Middleton didn’t really see enough of the ball. Denton headed over from Josh Macdonald’s teasing cross a few minutes before the break, but no-one from either team had grabbed the game by the scruff of the neck in the manner the injured Matty Kosylo might have done. 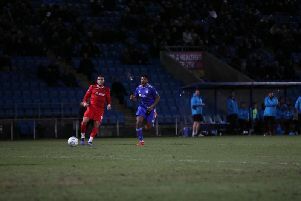 Aside from a couple of wobbly moments from the usually unflappable Matty Brown, The Shaymen were untroubled at the back, with Woking ineffective in attack. The ethos of manager Anthony Limbrick, a former youth coach at Southampton, was clear to see in Woking’s passing style, but it didn’t get them anywhere near a goal, although both teams lacked a cutting edge. A lovely pass by Middleton released Macdonald down the right 10 minutes after the interval, but his shot from out wide was easily saved by Nathan Baxter. Denton squandering a good chance when he dragged his shot wide from 15 yards. Woking replied with a superb effort by substitute Joe Ward from 30 yards that Sam Johnson saved well. Finally, after 70-odd minutes of nothingness, the game moved out of first gear. Woking finished strongly, with Inih Effiong, Regan Charles-Cook and Ward all going close, but 0-0 was about right. Halifax: Johnson, Clackstone, Garner, Brown, Wilde (Waring 89), Macdonald, Hotte, Middleton, McManus, Batty (Tomlinson 62), Denton. Subs not used: Nicholson, Oliver, Clarke. Woking: Baxter, Young, Orlu, Wynter, Ralph, Jones, Ferdinand, Appau (Isaac 56), Charles-Cook, Effiong, Philpot (Ward 68). Subs not used: Saraiva, Mason, Stoksavljevic.